The RNLI is in search of new recruits to spend the summer working on some of Sefton’s most popular beaches, with applications now open for 2019’s beach lifeguards. Lifeguards on our beaches are essential in supporting the RNLI to reduce the number of people who drown at the coast, and to help keep people safe by providing essential local safety advice to the thousands of visitors who make their way to Sefton’s coast each summer. RNLI lifeguards patrol over 240 beaches around the UK and Channel Islands, including Crosby and Ainsdale. At the forefront of the RNLI’s lifesaving work, they responded to over 15,500 incidents and helped over 24,000 people in 2017. Successful applicants receive world-class training in search and rescue, lifesaving and casualty care techniques, good rates of pay and the chance to develop valuable skills for a future career. A launch event held last Thursday, January 24th, at Waterloo Community Centre highlighted the positive impact friendships have on people’s lives. Join in the fun at Litherland Sports Park, Boundary Lane on Tuesday, February 19th between 9am-12pm or Shoreside Primary School, Westminster Drive on Thursday, February 21st from 9am to 12pm. Sefton Council has launched a brand new crowdfunding initiative to help community groups and volunteers create incredible projects to transform the borough. 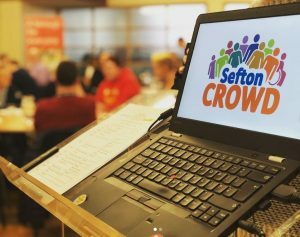 The local authority has teamed up with national crowdfunding platform Spacehive to create the #SeftonCrowd, a community led initiative which can help groups and individuals to improve the communities where they live. Sefton’s performance in helping young people not in education, employment or training (NEETs) is currently in the top 10 of local authorities nationally. Figures are released by the Department for Education regarding the annual publication of national participation figures of young people aged 16 to 18. Statistics are also released of NEET (not in education, employment or training) and NET (not in education or training) figures based on results from the annual labour force survey (LFS). Cllr Marion Atkinson, Sefton Council’s Labour Cabinet Member for Regeneration and Skills, said: “There is some fantastic work that is provided across Sefton in helping and supporting young people find work, training and staying in the education process.Latest figures collected locally reveal Sefton is currently ranked 144 out of 152 local authorities. Rankings are national comparisons from 1-152 where 1 equals worst performance and 152 equals best in that indicator. National figures will be released later in the year. “These figures that show how Sefton is in the top 10 of local authorities for helping NEETs is amazing news for the whole of the borough. “It is vital that we encourage young people to make positive choices about their future – promoting options around training, different career options, job applications and interview skills.